A few Friday nights had come and gone without our usual ritual of lighting the sabbath candles. There was no particular reason other than the tired inertia that the family slips into at the end of the week. We forgo the chance to renew ourselves when we are the most in need, separated in space rather than united in Heschel’s sanctity of time. But last night we brought the sabbath light back into our home. Stuffed with Mexican food, we took an after-dinner stroll from Wittenberg Platz to Viktoria Luise Platz before heading home. As big as she is, I didn’t notice Yolanda at first because it was dark out and she is tucked back into a corner. There she stands in all of her bronze glory and waits for the passerby to behold her. 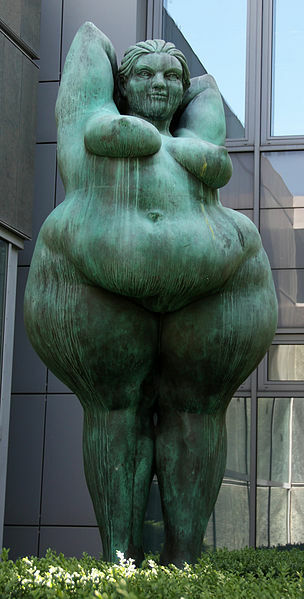 I was entranced by her size and strength, her uninhibited stance, and her defiance of societal standards of beauty. I stood before her and felt uplifted, while the three male members of my family quickly lost interest and moved on. We took the U-Bahn home and lit the candles, and I thought about Yolanda, a woman of Berlin, maybe even a Jewish woman, a woman to represent all women. Shortly after we seated ourselves in the women’s section of the sanctuary, my daughter whispered to me that she felt she didn’t fit in here. By the time we left, she was eager to return. It was our first time attending Shabbat services at the Pestalozzistrasse Synagogue, which follows a musical tradition dating back to the mid-1800s in which the cantor is accompanied by organ music and a choir. As the sounds of the organ reverberated throughout the room, both Olivia and I felt a bit like we were part of a Christian rather than a Jewish service. 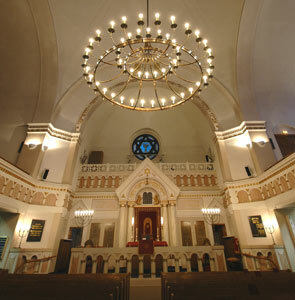 The entire service was sung and the Hebrew melodies, by German composer Louis Lewandowski (1821 – 1894), were unlike anything we had heard at other synagogues in Berlin. Beautiful, yes, but so unfamiliar as to make me feel like an outsider too. Sitting apart from the boys in our family also made the sabbath experience unique for us. We are a rather non-traditional Jewish family that generally avoids rituals that treat men and women differently. But Pestalozzistrasse calls itself a “liberal” synagogue, and although the men and women sit separately, the sanctuary is completely open so we could smile and make eye contact with my husband and sons. I loved sitting next to my daughter while surrounded by lots of Jewish ladies in interesting outfits. We often choose girls’ activities to do on our own so in a way this was just another chance for some quality girl time. Still, making our own choice to be separate is better than having someone else make that choice for us. What I most appreciate is the range of opportunities to experience being Jewish in Berlin. We’ve attended four of the city’s numerous congregations since we moved here and each has offered up its own evidence of the vitality of Jewish life in Germany today. Even though we didn’t feel quite at home at Pestalozzistrasse, the music was moving and inspirational and touched our spirits on a cold winter’s sabbath night in Berlin. Life has been as good as it gets but moments of stress do erupt at regular intervals in our apartment. An argument over a book, annoying chatter from our most talkative child (guess who? ), and yet another spousal miscommunication are just some of the ongoing challenges in our daily routine. Any night can end up with everyone grumping off into their little sector of private space, not to emerge until the next morning offers a fresh start at domestic tranquility. The Jewish sabbath has always had special meaning for our family because it offers us the possibility of transcending our daily struggles and coming together in a moment of peace at the end of the week. Last Friday we planned to attend the Reform synagogue’s evening service but did not make it. This would have required some fairly complicated logistics after a very long day and week and we all seemed to lack the energy. We often celebrate the sabbath at home, but this time we enhanced our usual ritual with new elements chosen by each of us. 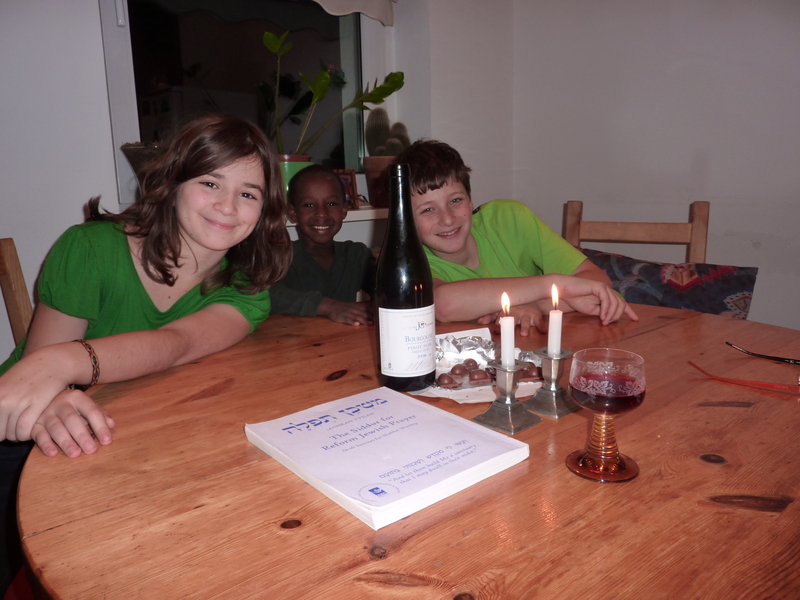 Avery chose one of the prayers he is studying for his bar mitzvah and I chose the kiddush (blessing over the wine, in this case a French pinot noir! ), the longest of the three shabbat blessings and one that I have never learned. Since Reform Judaism originated in Germany, what better place to learn about the rituals of Reform worship than in our apartment in Berlin. I still plan to attend Reform services, but the biggest blessing of the past week was to have my family gathered around the table with me in the spirit of shabbat and for some brief moments of peace in the house.